A couple of nights ago, I went to a friend's Pampered Chef parties. I was flipping through the recipe books and saw one entitled "Chicken Parmesan Soup." I didn't have time to look at the recipe closely and I ended up not buying the cookbook, but the title of that dish stuck with me and so I made my own creation of Chicken Parmesan Soup! One of my daughters asked for seconds so that is always a good sign! In a skillet (or I just used my soup pot and then rinsed it out) put at least 1/4 cup of olive oil and heat it up. Quickly cube up the baguette (reserve enough to make 1/2 cup of bread crumbs) and add it to the hot oil. Stir it around letting it toast. Add some of the parmesan cheese and some salt and pepper. Remove to a bowl once it is toasted. Slice chicken into thin pieces, like in a chinese stir fry. In a cleaned out soup pot add more olive oil and start browning chicken. Before it is cooked through, add the tomato paste, seasonings (salt, pepper, dried basil, oregano and garlic) Then add the can of tomatoes and the chicken stock. Bring to a very gentle simmer DO NOT BOIL or your chicken will be rubber. Add 1/2 cup homemade breadcrumbs. (This thickens the soup a bit.) Add the butter cubed up to the soup. 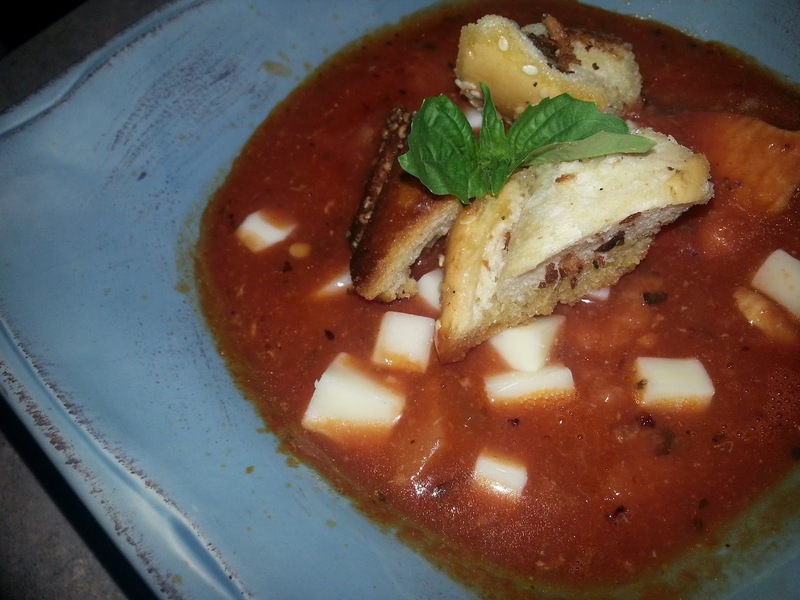 The butter is a trick I learned from Food Network, it mellows out the tangy tomato flavor and adds an awesome depth of flavor to any tomato soup or marinara sauce. Last, add more parmesan to the soup and stir to melt it in. Serve in a bowl with cubed up mozzerella (this starts to melt and gives you strings of cheese as you eat. YUM!) And a few pieces of the toasted baquette. Enjoy! Taking a moment away from my blog to share some exciting news. My husband just got a job in Washington, just across from Portland, OR and so we are moving from Texas up to Washington! I wanted to share the listing and hope you spread the word that my house is for sale. It's an awesome floorplan, with beautiful, mostly private views. 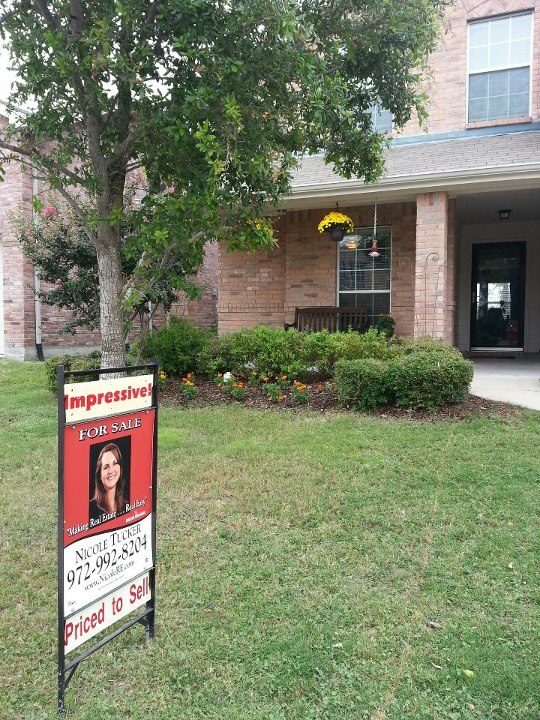 It's 4 bedroom, 2.5 bathrooms + office + gameroom, walk in pantry and large closets in all the bedrooms. Please check it out and send it to any friends you know who are thinking of moving! At best this is labeled a WIP (Work in Progress.) But it was tasty enough to warrant a mention, so that perhaps I can work on it in the future. Tastes sort of like fried coconut shrimp. Coat mushrooms in olive oil and grill or broil to get them started cooking. Chop onion, ginger and garlic and saute it in the butter. Remove to a bowl. Mix in cream cheese, apricot jam, worcestershire sauce and soy sauce. Add coconut flakes. Stir until everything is mixed well. Taste and adjust seasonings. Then add raw shrimp. Stir. Mound up on mushrooms. Place in a baking dish and cook for 15 minutes at 425 or until shrimp is cooked through. These are a big hit with our kids so I thought I'd share. It's a fast and healthy breakfast go to in our house. In a small sauce pan mix up some frozen fruit and a heaping spoonful of no-sugar added all fruit jelly. You could probably leave the jelly out, but it seems to help with the consistency. Add a squirt of honey. I make this mixture a bit over sweet, so when it mixes with the plain tart yogurt the sweetness evens out. With a potato masher, mash up your fruit mixture until it is almost pureed. Or if you like, you can puree it in a blender for kids who have texture issues. Above I made strawberry and banana. After the strawberries were mashed down, I removed it from the heat and mashed in a banana. 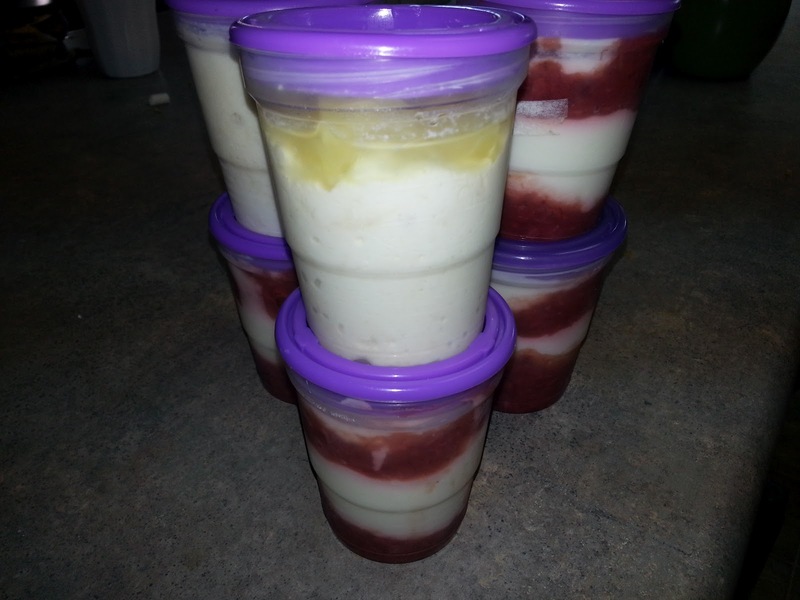 Layer in your container jam, whole-milk plain yogurt, jam, yogurt. If your kid (or you) likes granola, then put some in a small snack zip bag and store it on top so they can sprinkle it in. My girls have been eating cottage cheese since they were babies. I didn't put honey in it until they were a bit older, but now it's a favorite, especially with pineapples crushed in! So I just simply mixed some 4% cottage cheese with a bit of honey and topped with crushed pineapples. All ready to be stirred in and enjoyed come morning! I'm not sure what to even call this, but it was good! I'm sure a fancier lettuce would have elevated the dish, but this is called using the ingredients on hand. I was really craving THIS dish, but I did not have the right stuff. But it did get me thinking and it led me to this creation. Mix 1 tsp honey, salt and pepper, half a lime and some olive oil (a tsp or two) in a small bowl and pour over flank steak. Either grill the steak or put it under a high broiler. I did the broiler for 7 minutes on one side and about 3 on the second side. Let it rest before cutting it across the grain. Mince garlic and add to a small skillet. Cut asparagus in 1/4 inch pieces. Crush nuts and add them. Add a tbsp of olive or two and a splash of vinegar. Saute until asparagus has cooked for 4-5 minutes. Turn off heat and add feta, stir to melt it in. Taste and add salt as needed. 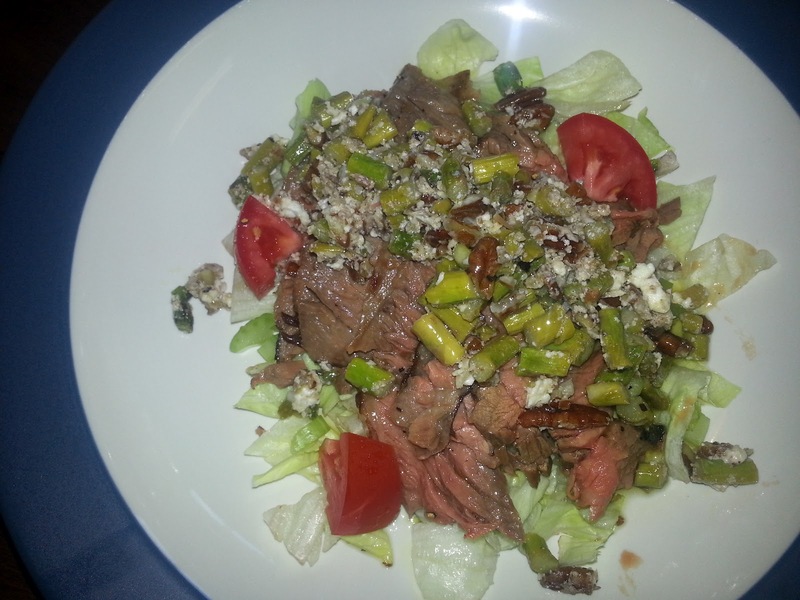 Make a side salad and serve steak on the side or on top of the lettuce. Top with the asparagus topping. I made a simple salad dressing that was the same as the steak marinade. I'm so excited these came out exactly like my mind pictured them when I decided to make this recipe. I'm sure you've heard me mention before how much my twin daughters (4.5 yrs old) love chicken wings. 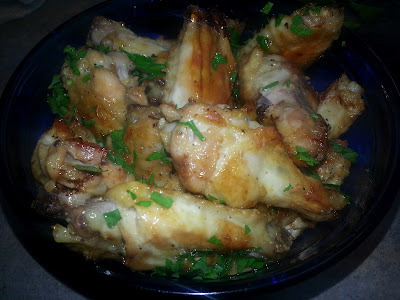 I usually make the balsamic wings and was afraid to deviate from that recipe, figuring it was the glaze that they liked and not necessarily the chicken wings. But they ate these up just as heartily as the others. The bonus is that these wings were a lot easier to make! Grate or finely chop the garlic in a small sauce pan. Add the butter, salt, olive oil and pepper. Simmer on very low for 20-30 minutes. This mellows the garlic out. Pour over raw chicken wings and let marinade for at least an hour. Line a baking sheet with foil and spread the marinaded chicken wings out where they are not touching. Bake at 425 degrees for 15 minutes, flip them over and bake for another 10-15 minutes. Chop parsley. Put chicken wings in a serving bowl, pour the run-off pan juices on top and sprinkle the parsley on and toss. Enjoy! Disappointed in my photo, because it doesn't show off this dinner very well. It is actually two layers of tortillas. I browned each layer in a skillet with a bit of bacon grease. Then I layed one spelt tortilla down, topped with some homemade refried beans, salsa and cheese. Then a second tortilla, taco meat and more cheese. In the oven for 15 minutes until the cheese is nice and melty. Top with lettuce, onions, more salsa, and sour cream. Very tasty! Who doesn't love the salad at Olive Garden? It's one of the best first course restaurant salads out there. But you have to choose between salad OR soup when you go. And if you've ever had their Zuppa Tuscano soup, it's pretty darn great. Which makes you think, should I get it or the salad? So now I can have it whenever I want. This isn't an official copycat recipe. It's been months since I've been to Olive Garden. I did not look up a recipe for this, I just made it from memory and it tastes pretty spot on from my memory. Except better, because I know there is no MSG, or bullion cubes or other ingredients that chain restaurants may or may not use. Cut up bacon and add it to a soup pot. Cook until bacon is almost crispy. Next put the sausage in the pot. If your sausage is in casings, cut the casings open and squeeze the sausage out. With the edge of your spoon, break up the meat into crumbles as it browns. Add the celery and continue sauteing. Add seasonings (dill, basil, salt and pepper.) Very thinly slice your potatoes. You can leave the peels on as I did, or peel them. Add stock and cream. Pull the kale leaves off of the hard stalk and chop into bite size pieces. Stir everything together and last add the kale. A few days ago I saw something labeled as Taco Pie on Pinterest. The thought of it struck with me and I decided to make my own version. I think the Pinned version had a potato flake crust, which just seemed a bit odd to me. 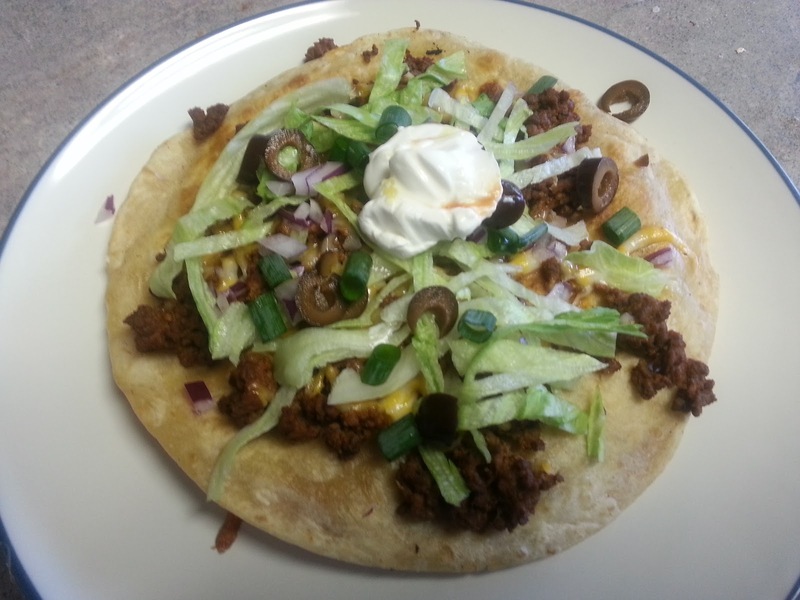 So I changed up the crust and made a few other adjustments, such as taking out the packaged taco seasoning and came up with this version which I think is pretty awesome. I basically took the idea of a 7 layer dip and made it into a meal instead of an appetizer. My husband took one bite and said, "Oh my god, this is SO good." Of course my 4.5 year old twins looked at it and said, "Ew... it looks disgusting." Once I got them to taste it though, they were pleasantly surprised and told me it tasted better than it looked. I guess beauty is in the eye of the beholder. I used to make pie crusts in a food processor before my food processor bit the dust a few months ago. I'll describe both methods. Food Processor: Put flours and salt in a food processor and pulse to mix. Add cut up butter and pulse until it resembled wet sand. Add ice water one tablespoon at at a time until dough pulls from the side and makes a ball. Do not over process. Wrap in plastic wrap and put in your fridge to rest for about 15-20 minutes. By hand: Mix flours and salt in a large bowl. Add cubed butter. With two knives start "cutting" the butter into the flour. You do this by holding a knife in each hand and cut across the flour and butter, this is cutting the butter and incorporating it into the flour. Again you are left with sand like texture. Add your ice water and with your hands gently massage the dough until it forms a ball. Wrap with plastic wrap and put in your fridge to rest for about 15-20 minutes. Cut onion into small pieces and saute in a bit of butter with bell pepper. Add garlic and seasonings. Add ground beef. Stir the beef as it is cooking so it crumbles into small pieces. When the beef is cooked through, add tomato paste and then the cornmeal. Taste and adjust seasoning as needed. Melt 2 tbsp butter in a small sauce pan. Add 2 tbsp flour and whisk together. Add 3/4 cup of milk and whisk until there are no lumps. Add tsp of tomato paste, 1/2 tsp cumin, salt and pepper and either some garlic powder or a grated clove of garlic. Last add cheese (I used monterrey jack, but cheddar or your favorite would work.) Stir until melted. Set aside. Roll out pie crust by liberally sprinkling counter with flour. Place in pie plate and form the pie shell. Scoop taco meat in the pie crust. Top with cheese. Add left over refried beans, or some from a can. (Check your ingredients if you used can and do not buy refried beans with hydrogenated oils.) Top with some cheese and bake at 375 for 30 minutes or until crust gets crispy. Remove from oven and allow to cool for 10-15 minutes. (This helps with the cutting.) Top with salsa, sour cream, chopped lettuce and olives. Other toppings that would be good are avocados or tomatoes. I hop you enjoy! This was so tasty, so easy and fast to put together. Mix all the seasonings in a bowl. Put on chicken and rub it in well. Pour juice on top and marinade in the fridge for a couple of hours or overnight. Put 1/2 stick of butter in a baking dish and put it in the oven while it preheats at 375 degrees. When butter is melted, pull out the baking dish and toss the chicken in the butter. Pour juice on top. Bake for 30 minutes. Increase temperature to 425 and bake for an additional 10-15 minutes or until skin is nice and brown. Cook noodles. Drain most of the water out. Add noodles to the pot and add the cream cheese, cheddar and cream. Stir until everything melts and comes together. Add salt and pepper to taste. Saute bacon and mushrooms in a pan until bacon is crispy. Add spinach and stir until it cooks down. Add a splash of cream, salt and pepper. Is there ever a good way to photograph a casserole? This dish was inspired by a pin off of pinterest. The original recipe was called something like Texas Ranch Casserole. But as soon as we ate my dish the family exclaimed, it tastes like enchiladas! Like I said, I took the original recipe as an inspiration point and made several changes. The biggest was to replace the canned soup with real cream. I kept this very mild since my kids don't like spicy food, but feel free to throw in some jalapenos or other favorite peppers to add some heat! Dice onion and start it sauteing in a pat of butter. Chop celery and add it to the onion. Next dice up the bell pepper, pablano chili and garlic. Add all of that to the onion and celery. Saute until vegetables soften. Add celery seed and chili powder, salt and pepper. Stir well. Next sprinkle in the cornmeal and toss all the vegetables in it. Quickly add the heavy cream and stir. Bring to a boil. Add the can of tomatoes, undrained. Let it simmer, stirring frequently until everything thickens up. Add 1/2 to a 1/3 grated cheese. Once thickened, turn off heat and add in cooked shredded chicken. Grease a casserole dish with butter. Cut tortillas into strips. Line one layer of dish with tortillas and some of the grated cheese. Spoon in some of the chicken-vegetable mixture. Add another layer of tortillas and repeat until you get to the top of the dish. Top with extra cheese. Bake at 350 for 40-45 minutes. I found a soup that was a winner with the entire family! This Cream of Aspargus soup was easy to make but it had a lot of steps and ended up dirtying up way too many pots and pans. I'm not sure how I would condense it down to less pot and pans and have it taste as good though. I was so happy when I saw the kids eating this green soup without so much as a complaint! Since my four year olds are baulking at the mention of vegetables lately, I'm getting creative! Halfway through Izzie mentioned that her dinner didn't have "any" vegetables in it. I told her that it was green because I pureed the asparagus. She just shrugged and said, "I like asparagus this way!" Meanwhile, toast pine nuts in a dry saute pan. Remove to a bowl and set aside. (At this point you could cook your chicken in the saute pan to save dirtying your grill pan, but I like the grill pan.) If you are not cooking your chicken in the saute pan, put the bacon grease and mushrooms in. Stir until mushrooms are caramelized. Add heavy cream, salt and pepper. Stir on medium-high until cream thickens. Set aside. Take your now cooked asparagus and put them in your soup pot. Add chicken broth. With an immersion blender, blend until asparagus breaks down completely. It's pretty fibrous, so it takes awhile. When it is done, pour the cream of mushroom soup that you made into the soup pot. Stir to incorporate. Add parmesan cheese to taste. Serve with the grilled chicken and pine nuts. I was looking some light and refreshing dinners/lunches and came across this salad that looked so yummy! Full of a bunch of my favorite things I knew this salad would be a hit with the entire family. Sure enough, my daughter Maddie ate and entire salad bowl of this and asked for more. Izzie isn't feeling well today, so she just wanted a small cup of my chicken noodle soup to sip on during dinner time. I'm not putting down amounts, just put ratios of what you like. This is a chop salad, so all the ingredients should be roughly the same size. My husband who also liked the salad suggested apples instead of pears next time. They'd give a bit more crunch. In a medium size bowl put 1 tsp of mustard. Drizzle in an equal amount of oil and start to whisk. When completely combined slowly, slowly drizzle in more oil as you whisk. When about half the oil is whisked in drizzle in sugar, maple syrup and apple cider viengar and salt. Continue drizzling the oil until it is gone. Stir in poppy seeds and taste. Adjust as necessary for seasonings. I came across this recipe while looking for some fun lunch ideas and it intrigued me enough that I had to make my own version of the sandwich. It's called a BeeSting Panini because it has honey and red pepper flakes. I love the salty/sweet/spicy combo of this sandwich, and I've already made two of them! I simplified down the original recipe which can be found on the Grilled Cheese Social Blog. Drizzle honey on each side of your ciabata bread. Chiffonad your basil and put it down on top of the honey. Layer in pepperoni and mozzarella cheese.Close sandwich and spread outside of bread with butter. Sprinkle hot pepper flakes in the butter and grill in a panini press until bread is crispy and cheese is melted. Enjoy! I'm pretty excited about tonight's yummy dinner. Mostly because I'm not in a cooking mood lately and this was easy. I do this on the stove top often, but this is the first time I've done it in the oven. Same amount of chopping, but instead of having to babysit the stove, the oven did the work. Chop your bell pepper, carrots and potato into bit size pieces. Same thing with the onion. Slice your sausage into 1/2 inch disks. Throw all of that into a nice baking dish (I love this stoneware from Pampered Chef!) Cut bacon into small pieces and place all around the top. Grate your garlic into the dish, sprinkle with salt, pepper and fennel. Add the beef broth and balsamic vinegar. Cube butter and dot it across the top. Cover and bake at 350 for about 20-30 minutes or until potatoes are cooked through. Uncover and bake at 400 for 15 minutes to get some carmelization. You could also add cabbage to this dish, or other root vegetables that you have on hand. 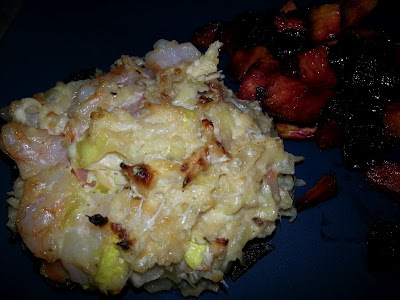 I know this photo isn't anything to write home about, but I've been really bad about taking any pictures of my recipes lately, which is why this blog hasn't gotten much attention lately! I've been very inspired by the many recipes that have paraded across Pinterest and this is my latest adaptation from a Pinterest recipe. It was called Sour Cream Chicken, but since I used seasonings that are found in ranch dressing it is almost like a "Ranch Chicken." Oil the bottom of a baking dish. Lay chicken tenders out in one layer across bottom of your baking dish. Then scoop out sour cream, dotting it around on top of the chicken. With the back of your spoon, smooth it out in one layer. Sprinkle spices and seasonings over the sour cream. I pulsed some bread in a food processor for fresh breadcrumbs, but either way, sprinkle them liberally over the cream cheese. Cut stick of butter into small squares and dot them all over the dish. Bake at 375 for about 20 minutes. Enjoy! Yum. Ginger Sesame Salmon Pitas. I just signed up to be part of a 10 week personal development seminar (through Landmark Education) that starts at 5:30 and goes to 10:30pm (normally their seminars are from 7-10, but I'm actually being trained in a leadership role around the seminar and need to be there early. The center is about 30-40 minutes away so that puts me pretty much eating dinner in the car. In the past I would have probably gone through a drive through and grabbed a hamburger on the way to class. This time I'm committed to eating healthy homemade meals before class. Pita pockets are very handy at being portable so that is what I came up with to make before my first session. Let me tell you, last night as I drove and ate my pita pockets full of omega rich wild caught salmon, I felt really great about my choice and commitment to health! (Not that driving and eating at the same time are recommended, but I'm in a "make it work" situation. *NOTE* Most of my recipes are close approximations. I rarely ever measure in my kitchen. This time, I really did just throw some stuff together, so please taste as you go to adjust to what makes sense for your taste buds. If it is too sour, add more sweet, if it is too sweet add more vinegar, etc. Marinade the fish for a few hours, not over night or the vinegar will *cook* the proteins in the fish and make it tough. Heat grill pan to really hot, cook salmon until it flakes apart easily. Shred cabbage and mix in grated carrot. In a separate bowl, mix the honey, vinegar, sesame oil, ginger and salt. Pour over cabbage. Toss in sesame seeds. Let sit for a couple of hours so the vinegar has a chance to break down the cabbage. Assemble pita pockets by stuffing with salmon and cabbage. Last night my mom and I were talking and she said something about making beef stroganauff for dinner. I was trying to figure out what to make for dinner too, and really needed to start something soon if dinner was going to be on the table at a decent hour. Luckily I had some chicken breasts thawed out, but no inspiration for them. When Mom said she was going to make beef stroganauff, that got my wheels turning. I wondered how the sauce we use would taste on chicken. So I used the stroganauff flavors of sour cream, dill and paprika as a launching point for this dinner. And since all four family members wanted seconds, I say it was a hit. Slice mushrooms and mince garlic. In a large skillet, saute them in butter. While they are sauteing, cut chicken into bit size cubes. Add chicken and cook almost all the way through. Remove everything from the skillet to a bowl. Add wine or chicken stock to deglaze the pan. When most of the alcohol has cooked away or the chicken stock reduces, add heavy cream. Stir for about 10-15 minutes on high until cream thickens. Add dill, paprika, salt and pepper. Reduce heat to medium low and add chicken. Gently cook until chicken is cooked all the way through in the sauce. Do not boil the chicken or it will get tough. When chicken is just cooked through, remove from heat and add sour cream. Stir until incorporated. Serve with pasta, rice or just eat it by itself!